There are blank books and then there are blank books. 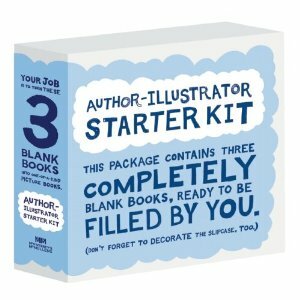 The new Author-Illustrator Starter Kit from McSweeney's McMullens is a blank book set that beats out the rest for creative design, in my opinion. Yes, it is cutesy. Yes, it is meant all in good fun. Yes, you can find other blank books if you like. So why consider these? There are three hardcover square shaped blank books in this thick cardboard slipcover. The slipcover itself is also blank so that the child author/artist can decorate it as well. I personally know of some children who enjoy story writing and write book series and I think it's fun to have three books in a slipcover that they could mess around with. I like the idea of using them for a creative writing project, a gift project which the child can make and then give away, as well as just for general use. My eldest made up some stories which we wrote down in a blank book awhile back. He illustrated them and I put the book on our bookshelf to be pulled out again when he is older. (I pulled the book down just the other day and found it charming and amusing!) Capturing the early imaginative workings of children is something worth doing, in my opinion. There is so much about what our children think, do and say that is lost to memory forever as it is. I like having these "hard copies" of the things that my children have thought up in their earlier years. Hence, I like this Author-Illustrator Starter Kit . I know that many of you feel the same way about your own children and their make-believe worlds. Therefore, I am sure you will be delighted and excited to know that McSweeney's McMullens has offered to giveaway THREE of The Author-Illustrator Starter Kit to three of my readers here at Reading to Know. READ THE FOLLOWING PARAGRAPH CAREFULLY! To enter, simply leave a comment below. This contest is open through Tuesday, August 16th, and is open to U.S. Residents only. THIS CONTEST IS NOW CLOSED. THE WINNERS, as selected by Random.org, ARE #1 - Marks of Faith, #3 - *Carrie* and #11 - Annette W.
You MUST leave a valid e-mail address IN your comment in order to be entered. I'm going to have to be a little feisty and particular on this point now. I've spent a great deal of time lately trying to find a way to contact winners and my time is very valuable to me. I assume that if you want to win this, you'll leave an easy way for me to let you know that you have! If you don't, I'll assume you don't care and I'll select another winner in your place. K? I'm sure you can think of many ways which this set of blank books can be used. They are made for fun and I anticipate at least three of you having great fun imagining up the possibilities with your own kids. Thank you, McSweeney's McMullens, for sending one of the Starter Kits to me for me to check out and for offering three more up to some of my readers. That sounds really neat! How fun! Looks great -- sign me up! Oh my 5 year old would love this! Thank you so much for the chance to win this. This looks amazing. I would love to win this. Thanks again. Such creative products! Endless possibilities...Thanks! We have NEVER done this. We need to...though I'm not sure M is truly capable yet...but we can try! J is always making up stories. We would LOVE a set like this to record them in! This sounds like something my daughter would love. These look great! Thanks for the giveaway! I'd love to win this for my young cousin --- I'm always encouraging him with his art projects and I know he'd love this! What a terrific idea! Oh, fun! I never saw your post of the winners, but came back here now as I just opened a fun surprise box containing these books. Thanks, Carrie!